Note: The graphic presentation for this survey is not shown because of pending revisions for 1980. Bureau of the Census, Industry Division, Washington, D.C. 20233, or call Doris Pope, (301) 763-2528.
mill and foundry products. Estimates are included for on page 5. 1Represents copper content weight, rather than metal weight. 'Represents uninsulated, bare tinned, and/or alloy coated wire. rRevised by 5 percent or more from previously published figures. (Z) L-ss than .00,000 pounds. .tt. ng scrap generated in the cupping and discing. 'r. * not include eletrlcal wire. 4Represents uninsulated, bare, tinned, and or alloy coated wire. 'Comparison of domestic manufacturers' shipments. export, and import co'des for copper-base mill products appears in table 4. 2Source: Bureau of the Census Report FT-410. U.S. Exports. are published in Origin of Exports of Manufacturing Establishments. M76 (AS)-8. appendix A. 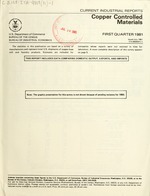 'Source: Bureau of the Census Report IM 145-X. U.S. Imports for Consumption and General Imports. Apparent consumption is derived by subtracting exports from the total of net shipments plus imports. 6This total does not include either insulated wire and cable products or brass bronze foundry products . poverty, education, health, social security, local government finances and employment, and many more. An updating of many of the statistics in County and City Data Book, 1972.